I learned this lesson this morning. For many months, I have been struggling trying to wake up an hour and a half earlier to make it to the gym. The alarm would go off, and I would not even snooze the damn bells…I would turn the alarm entirely off. There was no way with just 5-6 hours of restless sleep that I could bring myself to a place of energy and sweat. Today was one of those mornings – except for one thing. Yes, I turned off my 5:30 alarm, but I winded up waking up 20 minutes earlier than usual. Last night, I had set this 6:40am alarm in case I had a second spur of motivation to do a quick workout. And guess what happened? It worked. I woke up, chugged some water, laid out my yoga mat, and did some abdominal exercises for 15 minutes. Initially, I felt so tired, but I managed to push through it. In just 10 minutes, I began to feel more energized and motivated to start the rest of my day. My lesson was this: You can’t expect to wake up all of a sudden 1.5 hours earlier with no hesitation. Instead, set a smaller goal of 20 minutes earlier. Maybe tomorrow, add an extra 10 minutes to your morning. With this method, I know that I can eventually get to that goal time of 5:30am. 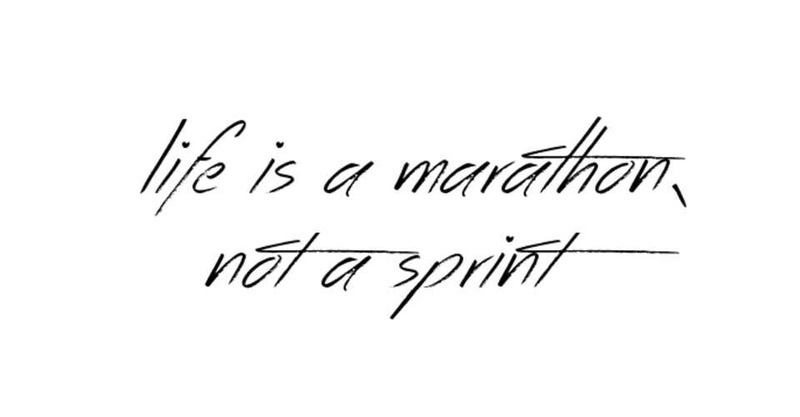 I am training for a marathon, not a sprint. Thank you Jamie for your lovely comment.